Japan broke ground today on a coastal surveillance unit near a string of islands at the centre of a bitter territorial dispute with China, a report said. Radar equipment will be installed on Yonaguni island to monitor ships and aircraft in the East China Sea, the Kyodo News agency said. The island lies around 150 kilometres (100 miles) southwest of the Tokyo-controlled Senkakus, which Beijing claims and calls the Diaoyus. The Ground Self-Defence Force surveillance unit comprising around 150 personnel will be deployed on Yonaguni by the end of March 2016, Kyodo said, citing Japan's defence ministry. "It's very important to take a solid surveillance posture on remote islands," Defence Minister Itsunori Onodera said after attending the ground breaking ceremony, Kyodo reported. The unit will "fill a void of SDF (Self-Defence Forces) presence" in Japan's remote southwestern islands, Onodera said. Chinese vessels and aircraft have regularly approached the disputed East China Sea archipelago -- thought to harbour vast natural resources -- after Japan nationalised some of the islands in September 2012, setting off the latest spate of incidents in a long-running territorial row. The ceremony comes at a time when Japanese Prime Minister Shinzo Abe is pushing to reconfigure Japan's role in the world, specifically that of its armed forces. He wants to re-interpret a law to allow Japanese troops to take up arms to defend an ally under attack, so-called collective self-defence. Beijing has sought to paint Abe's moves as a dangerous slide back towards its militarism of the last century. Today some Yonaguni residents opposed to the new surveillance unit scuffled with officials connected to the defence ministry, Kyodo said, adding they were concerned the island could become a target in any future conflict between Japan and China. Roger Federer beat holder Djokovic 7-5, 6-2 to reach the final. Roger Federer and Stanislas Wawrinka will play the first all-Swiss final since 2000 as both won straightforward semi-finals at the Monte Carlo Masters on Saturday. Federer who has never won the trophy in the principality, beat Novak Djokovic 7-5, 6-2 as the holder suffered with a right wrist injury which limited his serving to the 150 kph range. 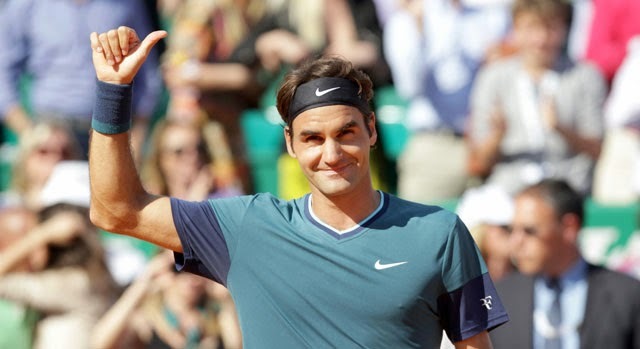 Federer, who has lost three finals in Monte Carlo to Rafael Nadal, will be making his first title bid here since 2008. Earlier Wawrinka, the Australian Open winner, booked his spot at the expense of David Ferrer 6-1, 7-6 (7/3) a day after the Spaniard stunned eight-time champion compatriot Rafael Nadal. The last all-Swiss ATP final was in Marseille in 2000 when Marc Rosset beat a teenaged Federer.